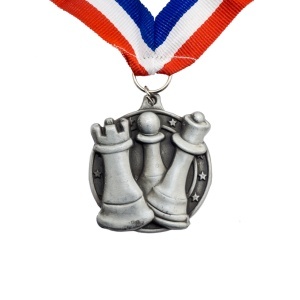 This Silver Coloured Medal is perfect for scholastic chess tournaments. Each medal comes with a 30" long nylon strap that is striped in red, white and blue. The strap is sewn together at the bottom to make a 'V' shape where the medal is attached. Each medal has space for engraving on the back. A great little award to keep kids motivated to play more! All Content & Images © 2019 The Regency Chess Company & Associates.